Earn 1 AOTA CEU (12.5 NBCOT PDUs/10 contact hours). This course is available in two formats: CD-ROM or online. Please order this product if you want the online format. If you prefer to order the CD-ROM format, click here. Participants will get more from this course if they have previously taken the CEonCD™ course Creating Successful Transitions to Community Mobility Independence for Adolescents, which provides occupational therapists with a deeper understanding of the unique life skills and community mobility challenges associated with cognitive and social limitations. 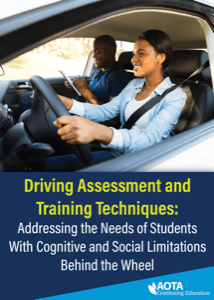 Community mobility skills development is highly individualized; the first course helps the therapist determine students' general readiness to learn to drive and participate in other forms of community mobility. It also describes the assessment tools and techniques that are referred to throughout this course. Identify the use of a visual search tool to improve a student's visual search skills and executive function skills for driving. Please Note: Online course content is flash-based and may not be easily viewed on some mobile and Mac devices. For information on exam, retake exam, certificate and return policy, please see our "Customer Serivce" page.